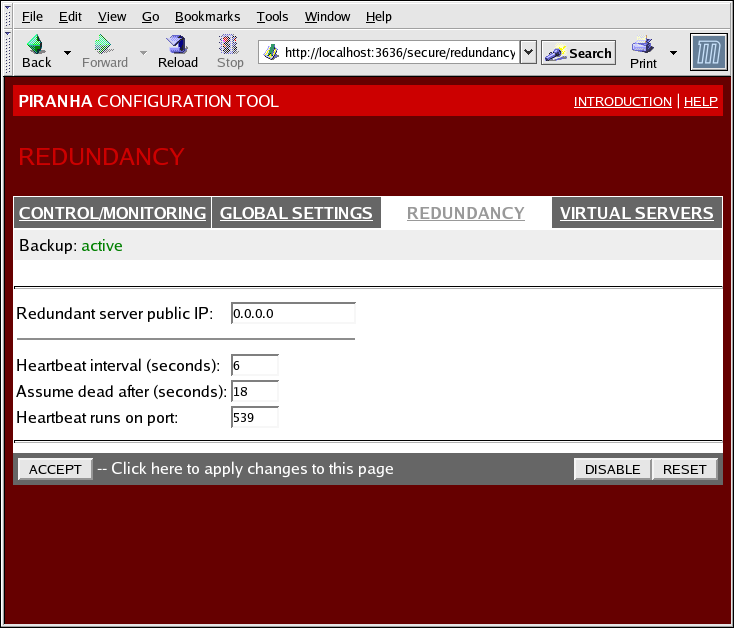 The REDUNDANCY panel allows you to configure the backup LVS router node and set various heartbeat monitoring options. The first time you visit this screen, it displays an "inactive" Backup status and an ENABLE button. To configure the backup LVS router, click on the ENABLE button so that the screen matches Figure 4.4, “The REDUNDANCY Panel”. Enter the public real IP address for the backup LVS router node. Enter the backup node's private real IP address in this text field. If you do not see the field called Redundant server private IP, go back to the GLOBAL SETTINGS panel and enter a Primary server private IP address and click ACCEPT. The next section of the panel is devoted to configuring the heartbeat channel, which is used by the backup node to monitor the primary node for failure. This field sets the number of seconds between heartbeats — the interval that the backup node will check the functional status of the primary LVS node. If the primary LVS node does not respond after this number of seconds, then the backup LVS router node will initiate failover. This field sets the port at which the heartbeat communicates with the primary LVS node. The default is set to 539 if this field is left blank. The final section of the panel is for enabling and configuration of the optional Synchronization Daemon and its various options. The Sync Daemon enables the active and backup LVS director to keep TCP state synchronized. When enabled, the active director will send a message multicast over the network with a configurable synchronization ID (or syncid) to a receiving backup director. Red Hat Enterprise Linux 6.5 introduces a new sync message protocol format designed to prevent interruptions to business services caused by premature timeout of persistent connections on backup nodes, causing inconsistent state in the event of failover. The new protocol format is not compatible with versions of Red Hat Enterprise Linux 6.4 or earlier, or kernel versions prior to kernel-2.6.32-406.el6. It is recommended to upgrade backup nodes before upgrading the master node to Red Hat Enterprise Linux 6.5. Check the box if you want to enable the Sync Daemon. The network interface through which the sync daemon will send/receive its multicast message. The default interface in this field is eth0. This field sets an identifier (ID) to multicast sync messages. Supported values are 0 to 255, with the default being 0 if the field is left blank. Remember to click the ACCEPT button after making any changes in this panel to make sure you do not lose any changes when selecting a new panel.